What costs more? A bridge for cars or a tunnel for ships? The last 24 hours have been eventful. If you need yet another perspective on world events, keep reading. If not, just skip to Other Stuff where it’s less serious. We launched missiles into Syria. This feels like the typical setup where the world calls on the US to act as the world’s police, our military is deployed, and the world decries our meddling in world affairs. A dictator is butchering his own people, but no one is willing to do anything about it except us (sternly worded letters don’t count as action). If we don’t do anything, we’re abandoning the region to nefarious powers. If we go in guns blazing, we’re warmongers. Ad hoc missile strikes seem to have minimal political backlash while still accomplishing a mission. If this doesn’t lay to rest the conspiracy theory that Vladimir Putin controls our executive branch, it certainly erodes its credibility. In one night, President Trump has crippled a political argument against him at home (that he’s a puppet of Russia) and signaled that military action is on the table. The General Secretary of the Communist Party of China , Xi Jinping, was at Mar-a-Lago, too. Interesting timing as he and President Trump discuss North Korea and US-Chinese relations in the broader scope. Changing the rules so the Senate can give Neal Gorsuch the thumbs-up seems to be taking a back seat to this Syria story as well. Ethically, we have a responsibility as members of the human race to defend basic human rights and the dignity of mankind across the planet. Practically, this is difficult at best to monitor and execute, especially when the rest of the world cannot be bothered to get its hands dirty. Are we the world’s police? Do we try to apply our principles across the globe or only where and when convenient? To act is to invite criticism from all sides. What do our leaders stand for and how deep is their conviction? Or is the priority winning a short term political game? The right answer is to act on principle. The challenge is how to compromise with our fellow humans on actions, while also maintaining our values. It’s winter in Northeast Ohio again until this weekend when we are supposed to hit 70 degrees. I hope to grill out at some point. Here’s my never-miss steak prep: Salt & pepper the steak then slather it with honey. It’s best if you let it sit for a while before you crack open a beer and toss it on the grill. Honey is key. Unless you’ve got a time-tested dry rub or seasoning, salt and pepper is really all you need. Keep it simple. Hang out by the grill and live in the present for a while. Norway wants to build a tunnel for ships. They expect that putting a ship-sized hole through a mountain will cost $315 million and take 3-4 years to complete. 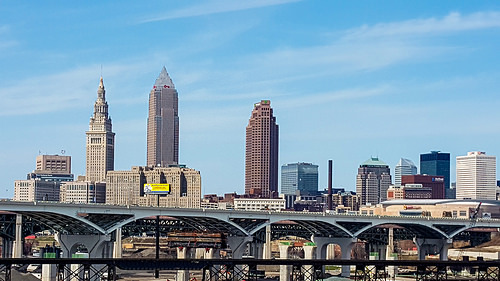 Meanwhile, in Cleveland, we are mostly finished re-building our innerbelt bridge for half a billion dollars after six years of work. Morgan Housel at Collaborative Fund is always a good read. How did we react to the car and airplane when they were invented? Have a great weekend. Wait at least 48 hours before reacting to news. There always seems to be more going on beyond the headline.